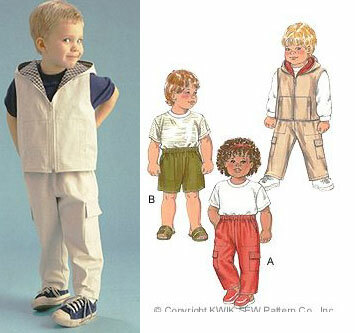 Toddler's pants have front pockets, back patch pocket with velcro closure and waistband with stitched elastic. View A pants have leg and pockets with flaps and velcro closures. Lined vest has hood, zipper front and patch pockets with velcro closures. Sizes 1T-4T included in one pattern.